Sons of the Desert (1933) is a classic Stan Laurel and Oliver Hardy comedy - the fourth of their full-length feature films, and possibly their funniest (the other contender is Way Out West (1937)). Their slapstick brand of comedy straddled the silent and talkie eras. It was entirely neglected for Academy Awards in its year of eligibility. The clueless, incompetent pair portrayed bumbling, innocent, derby-hatted fools in a hostile world: the thin, easy-going, but forever-victimized and dim-witted Stan, known for scratching his head with a bewildered look, whimpering, and speaking with a slight British accent; and the fat, wide-babyfaced, tie-fiddling Ollie, continually exasperated with his partner. This film was released in Britain under an alternative title: Fraternally Yours. The plot of this film, by director William A. Seiter, was a re-make of a similar film they had made earlier, Be Big (1930). 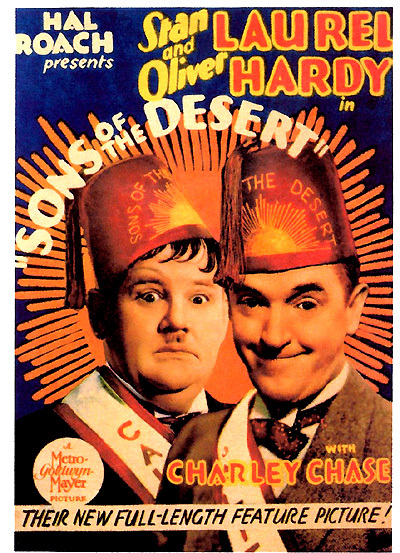 Stan (Stan Laurel) and Ollie (Oliver Hardy) belong to the oldest order of the Sons of the Desert, an all-male social fraternity (a parody of the Masons or the Shriners). In the opening sequence, the Exalted Ruler (John Elliott) is solemnly exhorting all the members (at a secret "special meeting" of the fraternal order) to "meet the situation with determination." The two latecomers arrive after the meeting is already underway, annoying the members and disrupting the proceedings as they gingerly (but noisily) wind their way through the seated audience to find their seats downfront. Stan adjusts his chair, moving it closer to Ollie and sharply pinching his hand - Ollie yelps loudly. After the Exalted Ruler looks at them with a stony glare, he is able to continue his speech: "This Oasis must face the situation with determination. Every man must be accounted for. Every man must do his part. There must be no weaklings in our midst. We must put our very hearts and souls into this great undertaking. There must be no thought of failure. We must stand shoulder to shoulder. We must work. We must sacrifice. The weak must be helped by the strong." Ollie looks at Stan to emphasize the point. The Ruler fervently tells the group that they all ("100 percent") must attend the annual national convention in Chicago the following week. All members are required to rise and take an oath to pledge and commit to attend. Once taken, the solemn oath "has never been broken by any man down through the centuries of time in the history of this fraternal organization." Stan looks a little skeptical, worried and doubtful that he can take the pledge, and he considers sitting down. Ollie pulls Stan to his feet, exhorting him to not falter and back out. The Ruler: Do you all solemnly swear to be present at our 87th Annual Convention at Chicago? The Group (thunderously): I do! The members end the meeting by singing their alma mater. Ollie: Of course she'll let you go. Why, she'll have to let you go. You took an oath! Ollie (scornfully): Do you have to ask your wife everything? Ollie: I never realized that such a deplorable condition existed in your home. Why don't you pattern your life after mine? I go places and do things, and then tell my wife. Every man should be the king in his own castle. Both boys (and their wives) live next door to each other ("Mr. and Mrs. Stanley Laurel," and "Mr. Oliver Hardy & Wife"). At their two doorsteps, after getting confused about who lives where, Ollie encourages Stan: "Now buck up. Go in and tell her you're going to the convention. Be a man, and I'll see you in the morning." Inside his own house, Ollie is confronted by his formidable wife Mrs. Lottie Chase Hardy (Mae Busch), whom he sweetly calls "Sugar." After learning that Stan's wife Betty is duck-hunting and that he has just locked himself out of his own house, Ollie receives permission from his wife for Stan to come in and wait until she returns. Stan makes himself right at home - he takes a magazine, sits down, and reaches for an ornamental wax piece of fruit. After helping himself and taking a few bites out of it with gusto - and then scratching his head in his characteristic way without noticing anything unusual, Ollie informs his dumb pal: "Why that's not real fruit! It's imitation. It's made of wax!" Mrs. Hardy points out: "Oh, so that's where it's been going. That's the third apple I've missed this week." Ollie: You see, the Sons of the Desert are giving their annual convention in Chicago next week, and Stan and I are going. Mrs. Hardy: Oh you are. Mrs. Hardy: Why, I hope you have a nice time, dear. Mrs. Hardy: Just this. You're not going! Ollie: What do you mean, I'm not going? Mrs. Hardy: Just that. You're NOT going to the convention. You're going to the mountains with me! Mrs. Hardy: Now listen, dodo, you keep out of this. Ollie: Wait a minute, sugar. There's no use getting excited. You're making a mountain out of a molehill. Stan: Certainly life isn't short enough. Now, wait a minute. You listen to this. I want this understood once and for all. I'm not going to the convention. I'm going to the mountains. Stan: Are you going to stand for that? Stan: But why do you want to go to Honolulu? Ollie: Don't you understand that this is only a subterfuge? To throw the wives off the track, so that we can go to the convention. Stan: Oh, then you're not going to the mountains. The next madcap sequence with the scalding hot water tub is a hilarious, slapstick routine. Mrs. Hardy brings more water for the tub and an aspirin for her ailing husband. Moments later after Stanley is handed the aspirin, he promptly loses it. In his avid search for the pill behind Ollie in the chair, he propels Ollie - bottom-first - into the hot tub. After Stan re-positions the tub behind Mrs. Hardy, she falls backward into it, pinning Stan's head under the water with her weight. Ordered to get rid of the tub, Stan overturns the tub and spills water all over the living room before reaching the kitchen. Mrs. Hardy bumps directly into Stan, and then stumbles over the tub in the middle of the kitchen. In retaliation, she yells: "You wax-eater" and throws the tub at Stan. But she misses, hitting Ollie instead. In a memorable image, Ollie's head sticks out from the jagged bottom of the upside-down tub, fitting over his chubby face like a collar. Oliver: Why did you get a veterinarian? Stan: Well, I didn't think his religion would make any difference. Stan thinks that Ollie is "suffering from a nervous shakedown." The vet suspects that Ollie may have a bad case (or double case) of "Canus Delirous." The doctor administers a large pill in the customary fashion, instructing: "Sit up. Sit up. Open your mouth," while snapping his fingers in front of Ollie's nose, jamming the pill into his mouth, and forcing him to swallow it. Ollie (frustrated): That settles it. I'm not going to Honolulu. Mrs. Hardy: Oh yes, you are. You're going to Honolulu if you have to go alone!